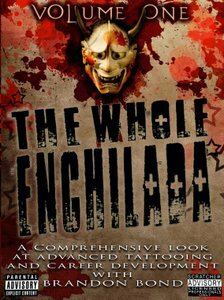 "The Whole Enchilada" is an incredible collection of motivational and professional information directly pertaining to all levels of a Tattoo Artist's Career. This DVD is being released by Brandon Bond and his Publishing Company STRANGLEHOLD PUBLICATIONS, and will be made available ONLY to professional Tattoo artists. After an artist purchases the DVD ONLY through www.strangleholdmerch.com the purchaser will be contacted directly by the Stranglehold Staff for various forms of confirmation options. We will make it extremely EASY for anyone involved in the Tattoo Industry to purchase the dvd, if you have a buisness liscence or a yellow pages ad or a website, or an inked nation acct or myspace acct or tattooartists.org acct - our staff will look at those pages to determine if you are ready to purchase. If confirmation is not possible, the purchaser will be refunded. You have to purchase the DVD FIRST to make it worth our time and effort but we WANT to send it to you so relax, we will make it as easy as possible. This 2 hour+ film is in NO WAY meant to REPLACE an apprenticeship!!! All aspects of sterilization and cross contamination must be covered prior to viewing this DVD.